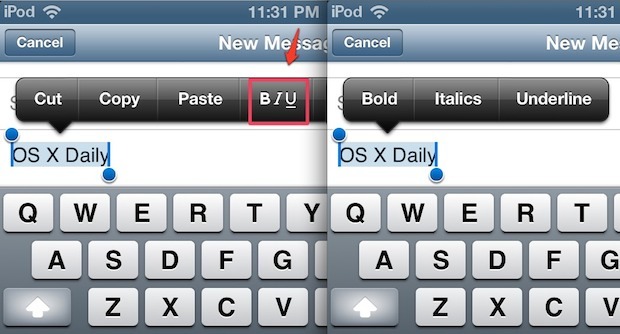 As you probably guessed, this litte-known trick works the same in Mail on iPhone, iPod touch, and iPad. Technically the stylize feature appears in a few other places in iOS too, but we’re focusing on the Mail app because this feature is universally supported there, whereas apps like Notes do not yet support it. This could be new from iOS 6 onward, I don’t have an older iOS device handy at the moment to give it a try and find out for sure. We covered a handful of helpful typing tips for iOS and somehow missed this one, thanks for sending in another great tip Mithilesh! This works on my original iPad with iOS 5. Would be nice if we could use this when sending iMessages from iPhone too. I’ve never seen it before, so it was not known to me and I am quite sure many others. Are you having a bad day Tom? i agree with tom, it’s not little-known or a trick. if you’ve not seen it before, it doesn’t make it so. btw, your site is excellent.